I’m so excited to share this Native American Southwest Sunburst c2c crochet afghan because with all big projects, completing it comes with such a feeling of relief and accomplishment! This blanket uses some of my favorite colors, is super soft, and man, I’m just happy that it’s done! When Lion Brand reached out to me and requested a corner-to-corner afghan, I knew I wanted to make a throw-sized blanket, not a full-size blanket like my Zoodiacs Afghan. This time, I really wanted something that would look at home on the couch, and I was a bit enamored with the idea of fringe. I’ve been toying with the idea of fringe for a while now, but never quite found the perfect project to use it on. 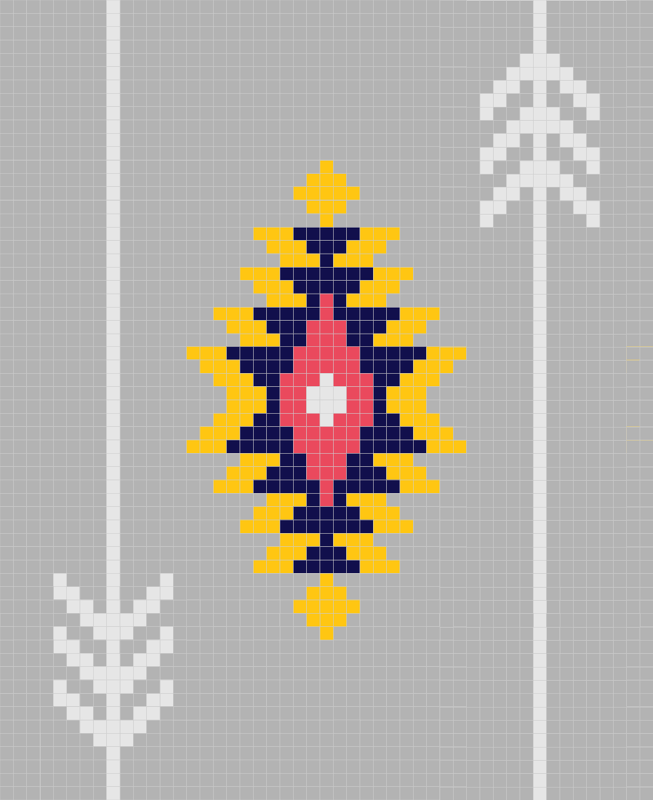 After a couple of doodles, I landed on this Southwestern motif, and knew that it would look great with some fringe to finish it off. 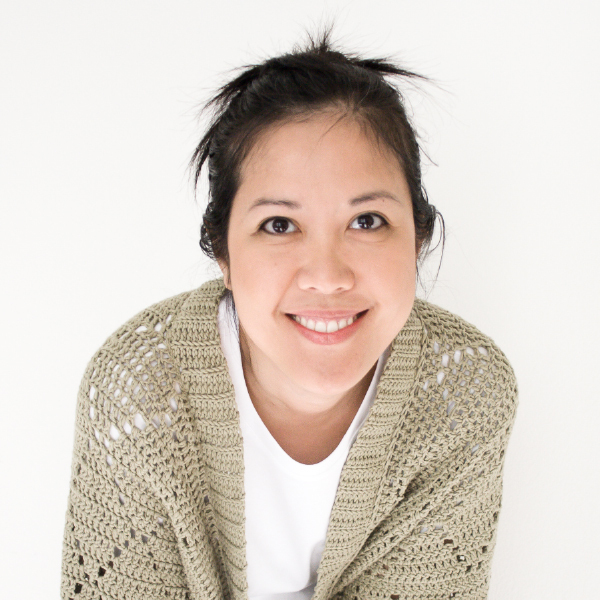 For this afghan, I used Lion Brand Vanna’s Choice, a true staple in my collection. I love the color choices and its lightweight feel. It can withstand quite a bit of handling, which is perfect for blankets, since I make my blankets to be used, not hang out in a closet. I also chose a Clover USA J hook, at 6.00mm. This isn’t the hook recommended for the yarn, but I like this size as forces me to have a looser gauge, and “airs out” my stitches a bit. If you need a primer (or a refresher!) 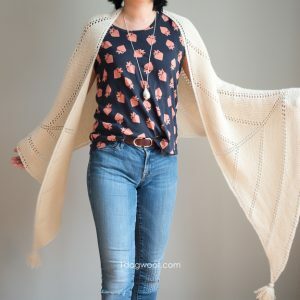 on corner-to-corner crochet, I’ve compiled a c2c pictorial collection that takes you step-by-step through the different techniques used in this project. 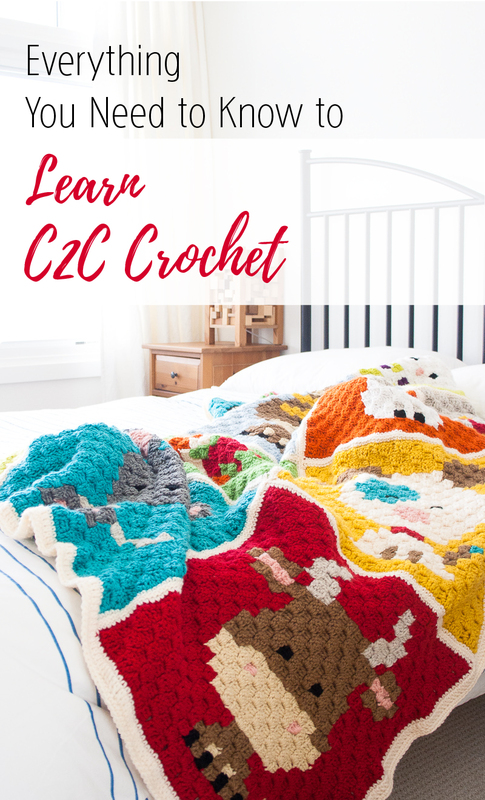 Last year, when I published my Zoodiacs Afghan, I also published a companion post that teaches corner-to-corner crochet using a series of videos. So, depending on how you learn best, whether it’s by video, pictures, or text, I should have you covered! Usually, I just publish a graph for my corner-to-corner patterns, but this time, I’ve written out exact text instructions for every row in this blanket – just keep scrolling to see the entire pattern. Since I wrote out each row, I indicated exactly where I start a new bobbin. I hate having a ton of little bobbins around, and I weaving in unnecessary ends, and I hate tying on more yarn when I run out, so I try to optimize the yarn that I use. If there’s a huge swatch of one color and I don’t anticipate having to cut that, I’ll use yarn straight from the skein. 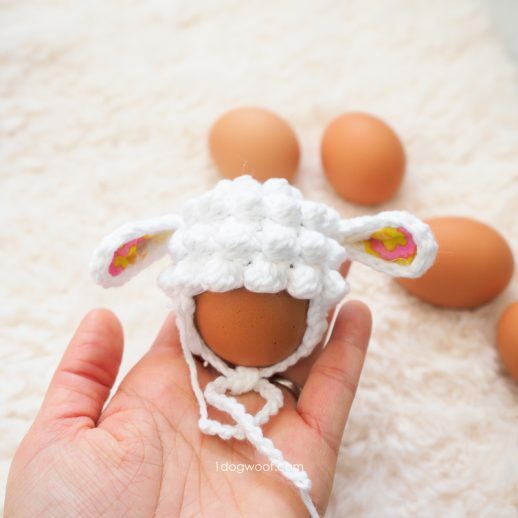 If I count forwards and see that I’ll only need to work a small number of squares with a particular color, I’ll measure and cut a length of yarn and create a clothespin bobbin for that little bit. Sometimes, I get caught in the middle and need to create a bobbin that is yards and yards long – then I’ll wrap it around a dowel and pop it into my Modular Bobbin Holder, which helps me keep all my yarn untangled. To measure how much yarn you need for a bobbin, just frog a single square and see how much yarn it used. Then multiply that by the number of squares you’ll need to work, and add a foot or more to cover your tails, pun intended, ha! The bobbins get messy, as you can see, but it’s like going through white water rapids – you just get through it and then it’s over! Working like this does require a bit of forward thinking. I jotted notes on my graph to show which direction I was working in, and where I thought I needed to switch bobbins so I could calculate the size of each bobbin. It’s definitely extra work, but pays off in the long run….just like your parents said it would. 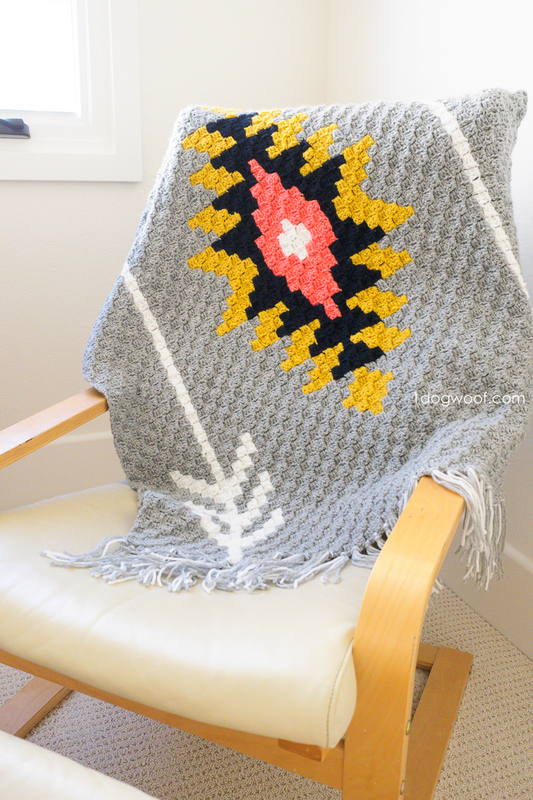 Thanks to an awesome collaboration with Lion Brand, you can purchase the Southwest Sunburst Afghan as a crochet kit! The kit includes the pattern along with all the Lion Brand Vanna’s Choice yarn you’ll need to make your own corner-to-corner blanket. Or if you’d just like to print this pattern, you can purchase an inexpensive PDF from my Etsy or Ravelry shop that has a large full-page graph, along with all the text instructions. Here’s all your Afghan options, made simple! I just want the graph – keep scrolling! 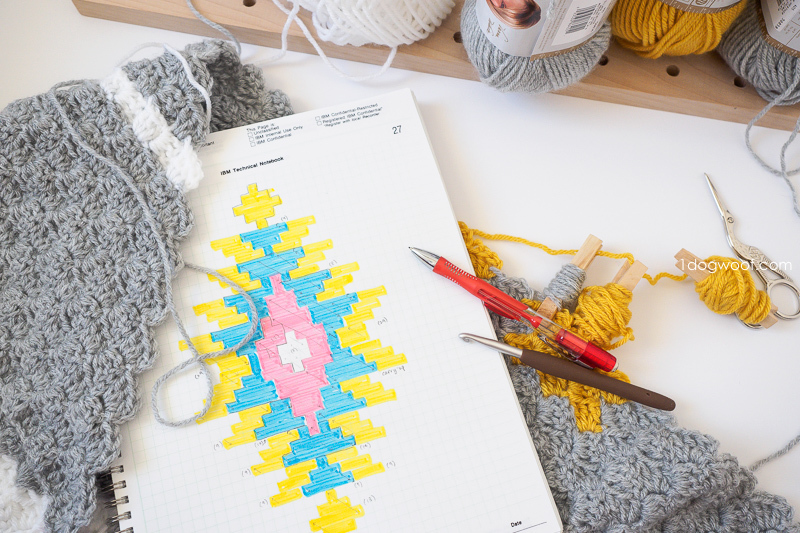 I want the printable PDF with the full-size graph and written instructions – find it on Etsy or Ravelry! 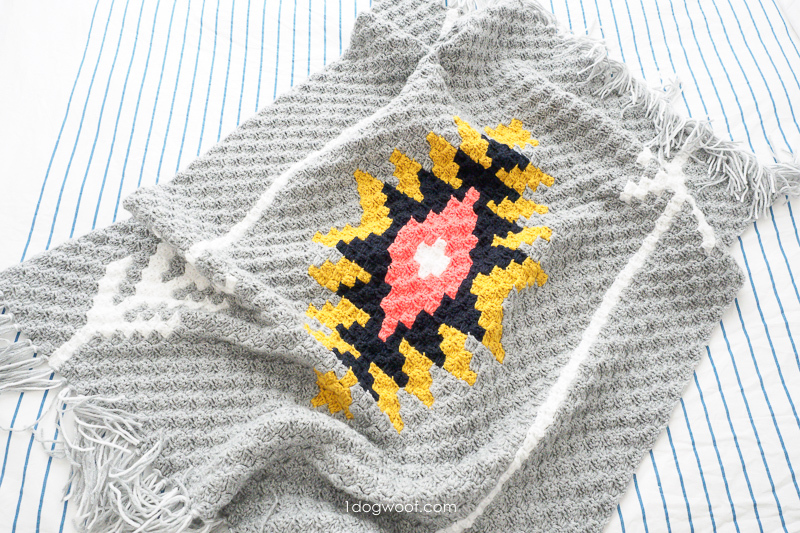 I want it all – a printable pattern plus all the Vanna’s Choice yarn needed to make this blanket – get the Lion Brand kit! I want it all, and a unicorn – well, ok, how about a unicorn stuffie? The instructions work from the bottom left of the chart. Use different balls of yarn on either sides of the white arrows to avoid having to carry the yarn back and forth across the white arrow. 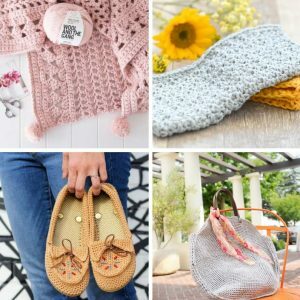 Check out my blog for 9 different Corner-to-Corner Crochet Pictorials on different tips and techniques, or watch my series of Corner-to-Corner video tutorials. “New 13sq bobbin” – Cut a length of yarn that can work 13 squares, and wind onto a bobbin. 1 square – Join to next ch sp with sl st. Ch 2. Work 3 dc in ch sp. 1 increase – Ch 6. Work 1 dc in 4th ch from hook. Work 1 dc in each of next 2 ch. 1 decrease – Join to previous row with sl st. Turn. Work 3 sl st across sq. Sl st into ch sp. Ch 3. Work 3 dc in ch sp. Row 1: Ch 6 in GRAY. Work 1 dc in 4th ch from hook. Work 1 dc in each of next 2 ch. (1 square completed). Row 3: Work 1 increase. Turn. Work 2 sq. Row 4: Work 1 increase. Turn. Work 3 sq. Row 5: Work 1 increase. Turn. Work 4 sq. Row 6: Work 1 increase. Turn. Work 5 sq. Row 7: Work 1 increase. Turn. Work 6 sq. Row 8: Work 1 increase. Turn. Work 7 sq. Row 9: Work 1 increase in WHITE. Turn. With GRAY, join to next ch sp with sl st. Complete the square. Work 7 more gray squares. Row 10: Work 1 gray increase. Turn. Work 7 gray squares, 1 white square. Start a new ball of gray and finish the row with 1 gray square. Row 11: Work 1 gray increase. Turn. Work 1 gray sq, 1 white sq, 8 gray sq. Row 12: Work 1 gray increase. Turn. Work 3 gray sq, 5 white sq (See bringing color down), 3 gray sq. Row 13: Work 1 gray increase. Turn. Work 3 gray sq, 5 white sq, 4 gray sq. Row 14: Work 1 gray increase. Turn. Work 7 gray sq, 2 white sq (See carrying color up), 4 gray sq. Row 15: Work 1 gray increase. Turn. Work 4 gray sq, 2 white sq, 8 gray sq. Row 16: Work 1 gray increase. Turn. Work 3 gray sq, 5 white sq, 1 gray sq (carry the white), 1 white sq (carry the gray), 5 gray sq. Row 17: Work 1 gray increase. Turn. Work 5 gray sq, 1 white sq, 1 gray sq, 5 white sq, 4 gray sq. Row 18: Work 1 gray increase. Turn. Work 7 gray sq, 2 white sq, 1 gray sq, 1 white sq, 6 gray sq. Row 19: Work 1 gray increase. Turn. Work 6 gray sq, 1 white sq, 1 gray sq, 2 white sq, 8 gray sq. Row 20: Work 1 gray increase. Turn. Work 3 gray sq, 5 white sq, 1 gray sq, 1 white sq, 1 gray sq, 1 white sq, 7 gray sq. Row 21: Work 1 gray increase. Turn. Work 7 gray sq, 1 white sq, 1 gray sq, 1 white sq, 1 gray sq, 5 white sq, 4 gray sq. Row 22: Work 1 gray increase. Turn. Work 7 gray sq, 2 white sq, 1 gray sq, 1 white sq, 10 gray sq. Row 23: Work 1 gray increase. Turn. Work 10 gray sq, 1 white sq, 1 gray sq, 2 white sq, 8 gray sq. Row 24: Work 1 gray increase. Turn. Work 7 gray sq, 1 white sq, 1 gray sq, 1 white sq, 1 gray sq, 1 white sq, 11 gray sq. Row 25: Work 1 gray increase. Turn. Work 11 gray sq, 1 white sq, 1 gray sq, 1 white sq, 1 gray sq, 1 white sq, 8 gray sq. Row 26: Work 1 gray increase. Turn. Work 7 gray sq, 1 white sq, 2 gray sq, 1 white sq, 14 gray sq. Row 27: Work 1 gray increase. Turn. Work 14 gray sq, 1 white sq, 2 gray sq, 1 white sq, 8 gray sq. Row 28: Work 1 gray increase. Turn. Work 7 gray sq, 1 white sq, 3 gray sq, 1 white sq, 15 gray sq. Row 29: Work 1 gray increase. Turn. Work 15 gray sq, 1 white sq, 3 gray sq, 1 white sq, 8 gray sq. Row 30: Work 1 gray increase. Turn. Work 7 gray sq, 1 white sq, 21 gray sq. Row 31: Work 1 gray increase. Turn. Work 21 gray sq, 1 white sq, 8 gray sq. Row 32: Work 1 gray increase. Turn. Work 7 gray sq, 1 white sq, 23 gray sq. Row 33: Work 1 gray increase. Turn. Work 23 gray sq, 1 white sq, 8 gray sq. Row 34: Work 1 gray increase. Turn. Work 7 gray sq, 1 white sq, 25 gray sq. Row 35: Work 1 gray increase. Turn. Work 25 gray sq, 1 white sq, 8 gray sq. Row 36: Work 1 gray increase. Turn. Work 7 gray sq, 1 white sq. 27 gray sq. Row 37: Work 1 gray increase. Turn. Work 11 gray sq, 3 mustard sq (new 13sq bobbin), 2 gray sq, 1 mustard sq (new 9sq bobbin), 10 gray sq, 1 white sq, 8 gray sq. Row 38: Work 1 gray increase. Turn. Work 7 gray sq, 1 white sq, 11 gray sq, 1 mustard sq, 2 gray sq (new 4 sq bobbin), 2 mustard sq, 13 gray sq. Row 39: Work 1 gray increase. Turn. Work 12 gray sq, 3 mustard sq, 1 gray sq, 2 mustard sq, 1 gray sq (cut yarn with enough for 2 more sq), 1 mustard sq (new 9sq bobbin), 9 gray sq (join new gray yarn), 1 white sq, 8 gray sq. Row 40: Work 1 gray increase. Turn. Work 7 gray sq, 1 white sq, 7 gray sq, 1 mustard sq (new 9sq bobbin), 2 gray sq (new 4sq bobbin), 1 mustard sq, 1 gray sq, 1 mustard sq, 1 navy sq (new 9sq bobbin), 1 gray sq, 2 mustard sq, 14 gray sq. Row 41: Work 1 white increase. Turn. Work 13 gray sq, 3 mustard sq, 1 navy sq, 2 mustard sq, 2 mustard sq, 1 gray sq, 1 mustard sq, 2 gray sq, 1 mustard (new 24sq bobbin), 5 gray sq, 1 white sq, 8 gray sq. Row 42: Work 1 gray increase. Turn. Work 7 gray sq, 1 white sq, 6 gray sq, 1 mustard sq, 1 gray sq (new 2sq bobbin), 2 mustard sq, 1 gray sq, 1 mustard sq, 1 navy sq (new 14sq bobbin), 1 mustard sq, 2 navy sq, 15 gray sq, 1 white sq, 1 gray sq. Row 43: Work 1 gray increase. Turn. Work 1 gray sq, 1 white sq, 14 gray sq, 2 navy sq, 1 mustard sq, 1 navy sq, 2 mustard sq, 1 navy sq (new 10sq bobbin), 1 mustard sq, 1 gray sq, 2 mustard sq, 6 gray sq, 1 white sq, 8 gray sq. Row 44: Work 1 gray increase. Turn. Work 7 gray sq, 1 white sq, 7 gray sq, 1 mustard sq, 1 navy sq (new 48sq bobbin), 2 mustard sq, 1 navy sq, 1 mustard sq, 2 navy sq, 3 navy sq, 13 gray sq, 1 white sq, 3 gray sq. Row 45: Work 1 gray increase. Turn. Work 3 gray sq, 1 white sq, 12 gray sq, 3 mustard (new 9sq bobbin), 2 navy sq, 1 mustard sq, 2 navy sq, 1 mustard sq, 1 navy sq, 2 mustard sq, 7 gray sq, 1 white sq, 8 gray sq. Row 46: Work 1 gray increase. Turn. Work 7 gray sq, 1 white sq, 8 gray sq, 1 mustard sq, 2 navy sq, 1 mustard sq, 2 navy sq, 3 navy sq, 3 mustard sq, 11 gray sq, 1 white sq, 5 gray sq. Row 47: Work 1 gray increase. Turn. Work 5 gray sq, 1 white sq, 10 gray sq, 3 mustard sq, 2 navy sq, 1 pink sq (new 49sq bobbin), 3 navy sq, 2 navy sq, 2 mustard sq, 8 gray sq, 1 white sq, 8 gray sq. Row 48: Work 1 gray increase. Turn. Work 7 gray sq, 1 white sq, 5 gray sq, 5 mustard sq, 3 navy sq, 1 navy sq, 2 pink sq, 3 navy sq, 12 gray sq, 1 white sq, 7 gray sq. Row 49: Work 1 gray increase. Turn. Work 7 gray sq, 1 white sq, 11 gray sq, 3 mustard sq (new 9sq bobbin), 1 navy sq (new 36sq bobbin), 3 pink sq, 2 navy sq, 5 mustard sq, 6 gray sq, 1 white sq, 8 gray sq. Row 50: Work 1 gray increase. Turn. Work 7 gray sq, 1 white sq, 7 gray sq, 4 mustard sq, 1 navy sq, 5 pink sq, 1 navy sq, 3 mustard sq, 10 gray sq, 1 white sq, 8 gray sq. Row 51: Work 1 gray decrease (See decrease). Work 7 gray sq, 1 white sq, 9 gray sq, 3 mustard sq, 2 navy sq, 5 pink sq, 4 navy sq, 8 gray sq, 1 white sq, 8 gray sq. Row 52: Work 1 gray increase. Turn. Work 7 gray sq, 1 white sq, 9 gray sq, 3 navy sq, 5 pink sq, 3 navy sq, 11 gray sq, 1 white sq, 8 gray sq. Row 53: Work 1 gray decrease. Work 7 gray sq, 1 white sq, 10 gray sq, 3 navy sq, 2 pink sq, 2 white sq (new 8sq bobbin), 2 pink sq (new 7sq bobbin), 2 navy sq, 3 mustard sq, 7 gray sq, 1 white sq, 8 gray sq. Row 54: Work 1 gray increase. Turn. Work 7 gray sq, 1 white sq, 8 gray sq, 3 mustard sq, 2 navy sq, 1 pink sq, 2 white sq, 2 pink sq, 1 navy sq, 3 mustard sq (new 9sq bobbin), 9 gray sq, 1 white sq, 8 gray sq. Row 55: Work 1 gray decrease. Work 7 gray sq, 1 white sq, 8 gray sq, 3 mustard sq, 2 navy sq, 1 pink sq, 2 white sq, 2 pink sq, 1 navy sq, 3 mustard sq, 9 gray sq, 1 white sq, 8 gray sq. Row 56: Work 1 gray increase. Turn. Work 7 gray sq, 1 white sq, 10 gray sq, 3 navy sq, 2 pink sq, 2 white sq, 2 pink sq, 2 navy sq, 3 mustard sq, 7 gray sq, 1 white sq, 8 gray sq. Row 57: Work 1 gray decrease. Work 7 gray sq, 1 white sq, 9 gray sq, 3 navy sq, 5 pink sq, 3 navy sq, 11 gray sq, 1 white sq, 8 gray sq. Row 58: Work 1 gray increase. Turn. Work 7 gray sq, 1 white sq, 9 gray sq, 3 mustard sq (new 9sq bobbin) 2 navy sq, 5 pink sq, 4 navy sq, 8 gray sq, 1 white sq, 8 gray sq. Row 59: Work 1 decrease. Work 7 gray sq, 1 white sq, 7 gray sq, 4 mustard sq (new 24sq bobbin), (carry the navy up) 1 navy sq, 5 pink sq, 1 navy sq, 2 mustard sq, 10 gray sq, 1 white sq, 8 gray sq. Row 60: Work 1 gray increase. Turn. Work 7 gray sq, 1 white sq, 11 gray sq, 3 mustard sq, 1 navy sq, 3 pink sq, 2 navy sq, 5 mustard sq, 6 gray sq, 1 white sq, 8 gray sq. Row 61: Work 1 gray decrease. Work 7 gray sq, 1 white sq, 5 gray sq, 5 mustard sq, 4 navy sq, 2 pink sq, 3 navy sq, 12 gray sq, 1 white sq, 7 gray sq. Row 62: Work 1 gray decrease. Work 5 gray sq, 1 white sq, 10 gray sq, 3 mustard sq (new 9sq bobbin), 2 navy sq, 1 pink sq, 2 navy sq (new 8sq bobbin), 3 navy sq, 2 mustard sq, 8 gray sq, 1 white sq, 8 gray sq. Row 63: Work 1 gray decrease. Work 7 gray sq, 1 white sq, 8 gray sq, 1 mustard sq, 2 navy sq, 1 mustard sq (new 9sq bobbin), 2 navy sq, 3 navy sq, 3 mustard sq, 11 gray sq, 1 white sq, 5 gray sq. Row 64: Work 1 gray decrease. Work 3 gray sq, 1 white sq, 12 gray sq, 3 mustard sq, 2 navy sq, 1 mustard sq (new 9sq bobbin), 2 navy sq, 1 mustard sq, 1 navy sq, 2 mustard sq, 7 gray sq, 1 white sq, 8 gray sq. Row 65: Work 1 gray decrease. Work 7 gray sq, 1 white sq, 7 gray sq, 1 mustard sq, 1 navy sq, 2 mustard sq, 1 navy sq, 1 mustard sq, 2 navy sq, 3 navy sq (new 9sq bobbin), 13 gray sq, 1 white sq, 3 gray sq. Row 66: Work 1 gray decrease. Work 1 gray sq, 1 white sq, 14 gray sq, 2 navy sq, 1 mustard sq (new 9sq bobbin), 1 navy sq, 2 mustard sq, 1 navy sq, 1 mustard sq, 1 gray sq (new 4sq bobbin), 2 mustard sq, 6 gray sq, 1 white sq, 8 gray sq. Row 67: Work 1 gray decrease. Work 7 gray sq, 1 white sq, 6 gray sq, 1 mustard sq, 1 gray sq, 2 mustard sq, 1 gray sq (new 4sq bobbin), 1 mustard, 1 navy sq, 1 mustard sq, 2 navy sq, 15 gray sq, 1 white sq, 1 gray sq (cut gray yarn, leaving a tail for sewing in). Row 68: Work 1 white decrease. Work 13 gray sq, 3 mustard sq, 1 navy sq, 2 mustard sq, 2 mustard sq, 1 gray sq, 1 mustard sq, 2 gray sq, 1 mustard sq, 5 gray sq, 1 white sq, 8 gray sq. Row 69: Work 1 gray decrease. Work 7 gray sq, 1 white sq, 7 gray sq, 1 mustard sq, 2 gray sq, 1 mustard sq, 1 gray sq (new 2sq bobbin), 1 mustard sq, 1 navy sq, 1 gray sq (new 9sq bobbin), 2 mustard sq, 14 gray sq. Row 70: Work 1 gray decrease. Work 12 gray sq, 3 mustard sq, 1 gray sq, 2 mustard sq, 1 gray sq, 1 mustard sq, 9 gray sq, 1 white sq, 8 gray sq. Row 71: Work 1 gray decrease. Work 7 gray sq, 1 white sq, 11 gray sq, 1 mustard sq, 2 gray sq, 2 mustard sq, 13 gray sq. Row 72: Work 1 gray decrease. Work 11 gray sq, 3 mustard sq, 2 gray sq, 1 mustard sq, 10 gray sq, 1 white sq, 8 gray sq. Row 73: Work 1 gray decrease. Work 7 gray sq, 1 white sq, 27 gray sq. Row 74: Work 1 gray decrease. Work 25 gray sq, 1 white sq, 8 gray sq. Row 75: Work 1 gray decrease. Work 7 gray sq, 1 white sq, 25 gray sq. Row 76: Work 1 gray decrease. Work 23 gray sq, 1 white sq, 8 gray sq. Row 77: Work 1 gray decrease. Work 7 gray sq, 1 white sq, 23 gray sq. Row 78: Work 1 gray decrease. Work 21 gray sq, 1 white sq, 8 gray sq. Row 79: Work 1 gray decrease. Work 7 gray sq, 1 white sq, 21 gray sq. Row 80: Work 1 gray decrease. Work 15 gray sq, 1 white sq (new 8sq bobbin), 3 gray sq, 1 white sq, 8 gray sq. Row 81: Work 1 gray decrease. Work 7 gray sq, 1 white sq, 3 gray sq, 1 white sq, 15 gray sq. Row 82: Work 1 gray decrease. Work 14 gray sq, 1 white sq, 2 gray sq, 1 white sq, 8 gray sq. Row 83: Work 1 gray decrease. Work 7 gray sq, 1 white sq, 2 gray sq, 1 white sq, 14 gray sq. Row 84: Work 1 gray decrease. Work 11 gray sq, 1 white sq (new 8sq bobbin), 1 gray sq, 1 white sq, 1 gray sq, 1 white sq, 8 gray sq. Row 85: Work 1 gray decrease. Work 7 gray sq, 1 white sq, 1 gray sq, 1 white sq, 1 gray sq, 1 white sq, 11 gray sq. Row 86: Work 1 gray decrease. Work 10 gray sq, 1 white sq, 1 gray sq, 1 white sq, 1 white sq, 8 gray sq. Row 87: Work 1 gray decrease. Work 7 gray sq, 1 white sq, 1 white sq, 1 gray sq, 1 white sq, 10 gray sq. Row 88: Work 1 gray decrease. Work 7 gray sq, 1 white sq (new 8sq bobbin), 1 gray sq, 1 white sq, 1 gray sq, 5 white sq, 4 gray sq. Row 89: Work 1 gray decrease. Work 3 gray sq, 5 white sq, 1 gray sq, 1 white sq, 1 gray sq, 1 white sq, 7 gray sq. Row 90: Work 1 gray decrease. Work 6 gray sq, 1 white sq, 1 gray sq, 1 white sq, 1 white sq, 8 gray sq. Row 91: Work 1 gray decrease. Work 7 gray sq, 1 white sq, 1 white sq, 1 gray sq, 1 white sq, 6 gray sq. Row 92: Work 1 gray decrease. Work 5 gray sq, 1 white sq, 1 gray sq, 5 white sq, 4 gray sq. Row 93: Work 1 gray decrease. Work 3 gray sq, 5 white sq, 1 gray sq, 1 white sq, 5 gray sq. Row 94: Work 1 gray decrease. Work 4 gray sq, 1 white sq, 1 white sq, 8 gray sq. Row 95: Work 1 gray decrease. Work 7 gray sq, 1 white sq, 1 white sq, 4 gray sq. Row 96: Work 1 gray decrease. Work 3 gray sq, 5 white sq, 4 gray sq. Row 97: Work 1 gray decrease. Work 3 gray sq, 5 white sq, 3 gray sq. Row 98: Work 1 gray decrease. Work 1 gray sq, 1 white sq, 8 gray sq. Row 99: Work 1 gray decrease. Work 7 gray sq, 1 white sq, 1 gray sq. Row 100: Work 1 white decrease. Work 8 gray sq. Row 101: Work 1 gray decrease. Work 7 gray sq. Row 102: Work 1 gray decrease. Work 6 gray sq. Row 103: Work 1 gray decrease. Work 5 gray sq. Row 104: Work 1 gray decrease. Work 4 gray sq. Row 105: Work 1 gray decrease. Work 3 gray sq. Row 106: Work 1 gray decrease. Work 2 gray sq. Row 107: Work 1 gray decrease. Work 1 gray sq. Row 108: Work 1 gray decrease. Join final stitch to ch sp of adjacent sq and fasten off. 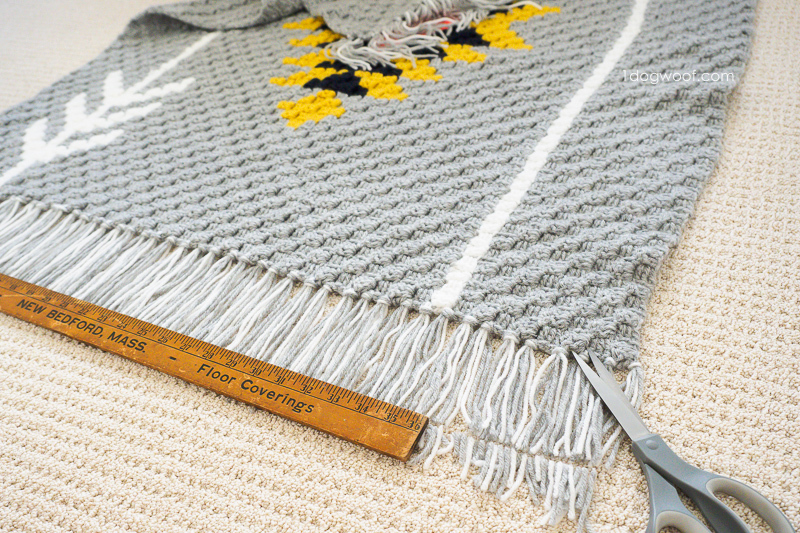 For each fringe, cut 2 1-foot-long piece of gray yarn and 1 1-foot-long piece of white yarn. Holding all three (3) pieces of yarn together, tie a lark’s head knot in the space between each square. Cut ends to make even. This afghan is the perfect size for curling up on the couch to watch tv, or work on my next crochet afghan! 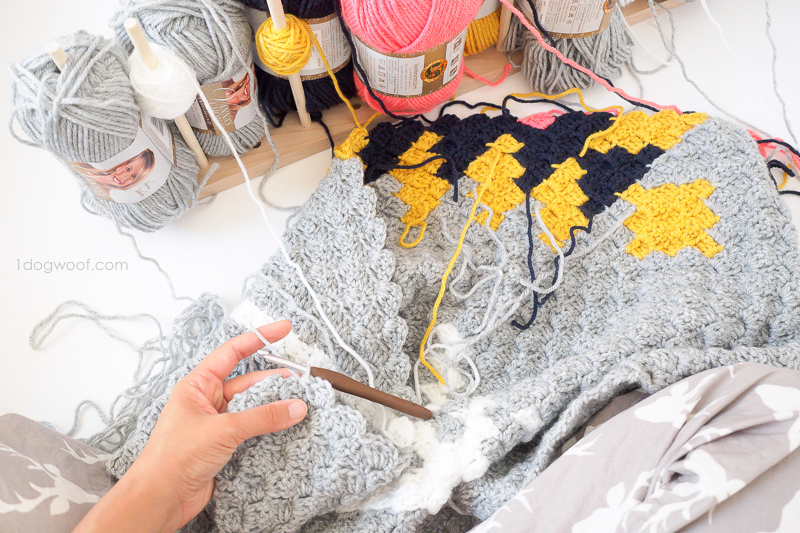 If you want more corner to corner project ideas, check out my Zoodiacs Afghan, or a smaller Chevron Baby Blanket. 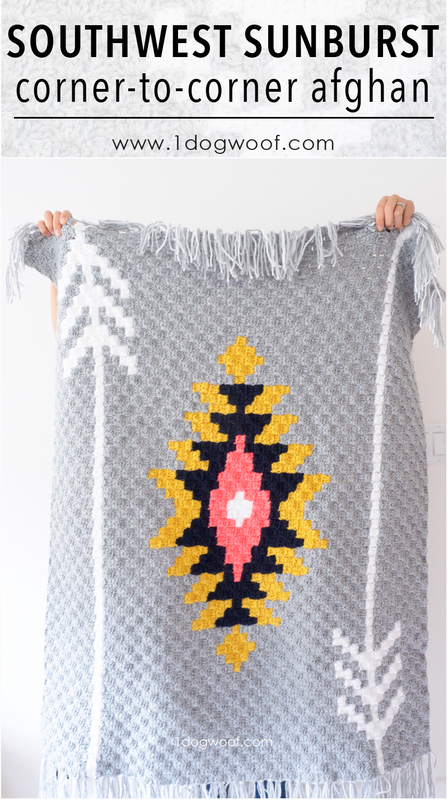 Now I’ve got a whole family of different sized blankets – which one is your “Goldilocks”? Please share your work with me on Facebook (One Dog Woof) or Instagram (@1dogwoof)! You can tag your post with #1dogwoof. 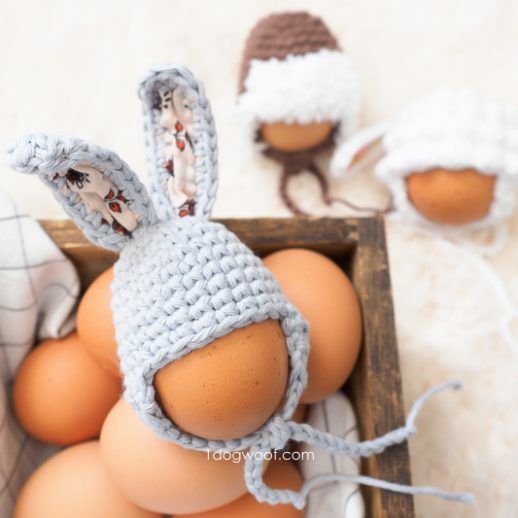 Enjoy this free pattern! Check out my pattern shops on Craftsy and Etsy where you can purchase printable PDFs of some of my favorite crochet patterns. These PDFs are formatted without comments or ads, and have instructional photos at the bottom for optional printing. Well done all around! For designing it, writing the patter and sharing it for free! I love the design and colors in this Southwest Sunburst. Thanks for your post. am I missing something or do these instructions only show a white stripe as opposed to the arrow shapes. I have started this pattern but the graph and instructions aren’t matching up. I’m using the written instructions and this is my second attempt… Get to row 30 and the numbers aren’t matching up. I just started and there is a mistake starting in row 10! So I think that throws the whole thing off! I skipped the white arrows completely and got to row 50 and there is an error somewhere in there in between 48 and 50. Not adding up for me either. there are lots of errors with the written instructions. The white stripe for the arrow starts on row 7 for the graph, but row 9 in the instructions! Also, the graph starts adding in yellow at line 34, but the instructions say it starts at row 38. Thank you for your beautiful pattern! When I saw this, I knew I had to do this one for my grandchild due in November as they are having a Southwestern theme. I just ordered my download off Ravelry to help support your work as you are so generous! I am a big fan of yours- your patterns are always delightful!! I love this pattern! It was my first C2C to do and you can tell with the evolution of my knowledge of color changing progressed from the different arrows I produced on either end. Thank you so much! This will make an awesome gift for someone!